DW (Drum Workshop), are one of the leading drum pedal manufacturers in the market. The 9000 Series is the industry-standard line of heavy duty hardware from DW. High grade steel constructions allow 9000 series hardware to withstand heavy and consistant use whether in long studio sessions or on tour. DW are determined to stay at the cutting edge of drumkit design, and a fantastic line of innovative features make the flagship 9000 series stand out. First off the pedal is built for speed feel and power and delivers in spades. DW have listened to the feedback from industry professionals and the latest outing now has an extended foot plate. 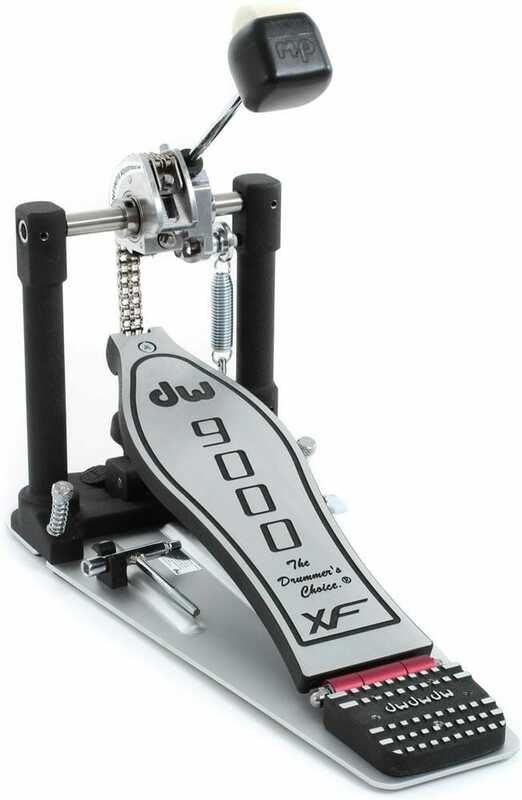 the 9000XF is infinitely adjustable, so you can tweak to get your perfect personal feel and response. To help with this DW have installed a low profile clip so that your pedal tuning key travels wherever your kick pedal goes! DW have also developed a number of fantastic new features including a non destructive hoop clamp with automatic level adjust to easily connect the pedal to any bass drum without sinking its teeth in. The non-slip velcro is also gone and replaced with a rubber grip which will stop messing up your mat or carpet at the end of every session.